What if all of the emotional and intellectual transformations we experience in our inner lives manifested themselves physically? Unable to hide what is surging or dying inside, what would we look like to others, and how would we communicate differently than we do in our cloaked forms? This week I have been exploring this idea by searching out ceramic sculptors whose work shows the “inside out.” With clay and glaze, they communicate powerful emotions and psychological transformations. Much like a poet may capture a moment, idea, and image in a single word, these artists capture the complex inner lives of their subjects in a single sculpture. Sara E. Morales-Morgan makes diminutive porcelain figures of women that, at first glance, resemble the kitschy ceramic mantlepiece decorations that became very popular in America in the 1940's and 50's. These idealized visions of feminine grace and beauty, often wearing the full length skirts and corsets from European aristocracy in ages past, were sought after symbols of refinement and culture to the growing middle class. While the shapes of this artist's wistful porcelain women may cause you to recall your grandmother's Hummels, make no mistake; Morales-Morgan's ladies pack a powerful punch. In “Day After Day,” three dark haired female torsos share a single skirt. One figure slumps forward, the second stands upright, and the third figure leans backward. Painted upon the skirt are three views from the inside of a home: through a window we see a blue sky, fluffy white clouds and neat green lawn, another is the same view at dusk or dawn, the third, a moonlit night. The artist seems to be representing the passage of time through the perspective of one woman in three different states of being. The gestures of the figures correspond with the rising, shining, and setting of the sun. It is this particular woman's view that we are seeing from the inside of her house- a house which also is an embodiment of her. She is prettily dressed with bows and neatly coiffed; her expressions are dreamy, almost doll-like. Morales-Morgan seems to be asking us to see the idealized women represented in this tradition of porcelain figures in a new way- from the perspective of the woman herself. To imagine the life of such a woman, not as a lovely figure to be gazed upon, but as a person stuck in the same routine, “day after day,” - unable to see the world from another perspective, unwilling to show any other expression, save the slight smile that would be pleasing to anyone who might see her. Where Morales- Morgan's figures draw upon a post-war European tradition of ceramics, Kukuli Velarde's forms take inspiration from pre-Colombian vessels. In her “ Isichapuitu” series, Velarde explores many versions of the same figure, a very round, female and somewhat corpulent body, based upon an Huastecan artist's sculpture made 2000 years ago. As she explains in her artist statement, Velarde uses the figures to express different aspects of her own experiences, and has even given the figures faces that resemble her own. By manipulating the bodies, and through her use of color and additional figurative elements, Velarde offers the viewer a wide variety of self-portraits. While her titles, such as“Grief,” “Hope” or “Pity” point to a universal concept, her sculptures are at once personal, specific and incredibly nuanced. In Censura, (“censored”) many hands cover the figure's face and body. Two fists grip the figure's wrists, and several others partially cover the mouth, nose and eyes, making the face appear disfigured. Completely covered are the figure's breasts and genitalia. 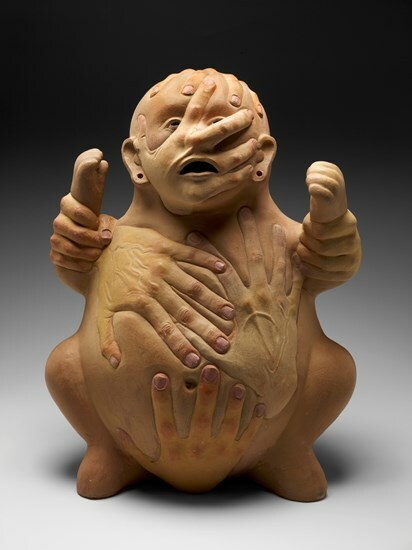 From the title of the piece, the viewer can infer that the hands here represent the forces of censorship- restricting movement, sexuality, sight, smell and taste. What I find really compelling about this work is that Velarde has rendered these censoring hands with the same color “flesh” as the figure itself. She also sculpted them in low relief – giving us the impression that they are either emerging from or submerging into the body. It is as if the hands of the censors have become part of the body being censored. This seems to suggest the insidious effects of censorship over time- that, through the abuser's careful and continuous restriction, the censored begin to censor themselves. And yet, this image can be interpreted another way: that, even with the internalization of this abuse, the figure has transformed the outsider's hands into a shape and color that is more natural to itself- perhaps in the way that a working palm develops a callous, or the way the body's defenses surround a tumor. The abusers cannot dominate the figure without being changed themselves. This image resonates with much of Velarde's other bodies of work, in which she presents the tension between the indigenous cultures of her native Peru and those who tried to colonize it. Adrian Arleo's “Eve, Honey Comb” is a near life-sized clay, glaze and wax encaustic sculpture of the biblical “first mother.” Eve's entire body, including the small rock plynth she stands upon, are modeled as if they were made entirely of honeycomb. Her naked body is riddled with cells in varying states- some are open, others appear to be partially or completely closed with wax. Her face appears forlorn, she looks to the side. Her gesture and expression are somewhat ambiguous. Could she be about to reach for something? Or has something she once held in her hand been taken away? The pale yellow finish on the sculpture, and the naturalism in which Arleo modeled each and every cell, begs us to touch and perhaps even taste. Might we be tempted to break off a piece to eat? By forming Eve out of a honey comb, Arleo asks us to consider the ideas of motherhood, creation, temptation, innocence, and sin. As mothers, women are both home and sustenance to their children, like the hive is to the bee. Conversely, perhaps Arleo is asking us to consider the mother-like qualities of bees, who create new life constantly in a diverse array of plants by pollinating. Consider also how Eve is being transformed with the wax covering of the cells- what will happen to her when they are all full? When they are emptied? She appears to be stopped in mid-gesture- will she solidify? Her expression seems to convey that she is not in harmony with this arrangement. Could Arleo be commenting on the hardships of birthing and fostering life? Or, is this Eve, once human, returning to nature as it was before the fall, before the knowledge of evil destroyed her innocence? While Arleo, Morales-Morgan and Velarde take inspiration from different traditions and vary greatly in their visual style, each successfully creates images that embody the complex workings of our inner worlds. This is the work of the artist: to show us the world from their unique perspective, but to also embrace the and honor the commonality of our human experience. I feel that I am enriched as a person from having seen each of these artists' works, and will continue to seek out art that informs my understanding of others and their perspectives.